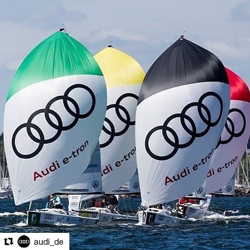 (Kiel, Germany)- The 136th edition of Kieler Woche (Kiel Week) will be taking place from June 16th to the 24th and participating will be 1,500+ sailboats and over 5,000 sailors for the week long event. Considered one of the world’s largest sailing events, Kiel Week is hosted by several clubs, with Kieler YC as the principal host. Even in its 136th year, Kieler Woche still plays a virtuoso performance on the keyboard of festivity: Kieler Woche is the largest summer festival in Northern Europe. During the week, more than three million visitors from all over the world will be diving into the colorful and multi-facetted life of Kieler Woche. Around 2,000 events in areas of culture, sailing, summer festival, entertainment, science, politics, industry and sport come together to form a maritime symphony. Visitors are promised nine days of high spirits in the far North. Three J/fleets are participating as one-design sailboat classes, including J/70s, J/80s and J/24s. There is a huge turnout for the J/70 class, with 48 boats registered, ready to do battle on the Baltic Sea. 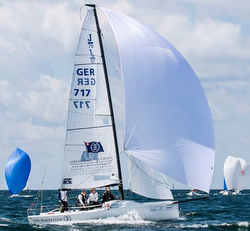 The growing participation in the German J/70 class can be directly attributable to the evolution of the Deutsche J/70 Segel-Bundesliga; it has over fifty-five sailing clubs and thousands of sailors engaged as team/club members sailing the highly popular J/70s on Germany’s vast array of lakes. In this year’s event, three nations are represented (Germany, Denmark, France). Notable German teams include Bjorn Belken’s PROCEDES DIVA, Gerd Knospe’s SANNA R, Frank Schonfeldt’s DER GERAT, Karsten Witte’s J-WD, Michael Grau’s PAINT IT BLACK, and Tobias Feuerherdt’s ONKEL HANNE. The Danish crew on Soren Larsen’s CRACKER JACK and the French crew on Christoph Cornelius’ FRA 23 will be hoping to crack the top of the leaderboard. The nineteen-boat J/80 class will see a cross-section of German, Dutch, and Danish teams. 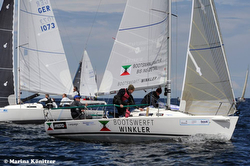 Leading the Germans will be past Kieler Woche winner, Martin Menzner on PIKE. Other top German crews hoping to be on that leaderboard include Andreas Rose’ TRUE GRIT, Hauke Kruss’ TAK FOR TUREN, Max Gebhard’s MARAMA, and Torsten Voss’ FRIDA. With an array of World and European Champions in the mix, the twenty-nine-boat J/24 class looks to have formidable competition. Leading that charge from the USA is Mike Ingham’s NAUTALYTICS, a past J/24 World Champion. The top British crew is Ian Southworth’s IL RICCIO, another World and European J/24 Champion. Then Swedish National Champion, Per-Hakan Persson will be racing FRONT RUNNER. The leading German crews should include Daniel Frost’s JJONE, Fabian Damm’s HUNGRIGER WOLF, Frank Schonfeldt’s HENK, Manfred Konig’s VITESSE, and Stefan Karsunke’s GER 5381. In the ORC Offshore Divisions, it will be interesting to follow the progress of Hinnerk Blenckner’s J/105 JALAPENO, Hauke Moje’s J/97 QUIRON, Frank Stahl’s J/97 MORENA, and Christian Tinnemeier’s J/125 NEEDLES & PINS. For any Kieler Woche results For more Kieler Woche sailing information Add to Flipboard Magazine. J/41 SOUAY1 Tops Samui Regatta Racing Class! Cleveland Race Week Off To Hot Start! J/112E J-LANCE 12 Crushes IRC Europeans! Sweden Midsummer Solo Challenge a Success! Araujo Crowned BOSCH Spanish J/70 Champion! Race for Prostate Cancer Awareness! Danish YOUNGSTERS J/70 Sailing Camp Launched! Brilliant Landsail Tyres J/CUP Regatta! J/70 Stars on Fox & Friends TV! Detroit sailors having some fun in Naptown! J/80’s Loving Chile’s Frutillar Cup!